We've started a blog about programming devices in the home. Our group is both designing a programming paradigm for end-user programming of household devices and actually building appliances that can be programmed wirelessly. Scratchable Devices enable the average person to program complicated scheduling and repetition, rich interaction between devices, and logical decision making. With an easy to use programming language, mind-numbing tasks such as pressing the "minute" button on an alarm clock 50 times in a row would be eliminated. The need to learn a different, complicated interface for each new electronic device would also be a thing of the past. 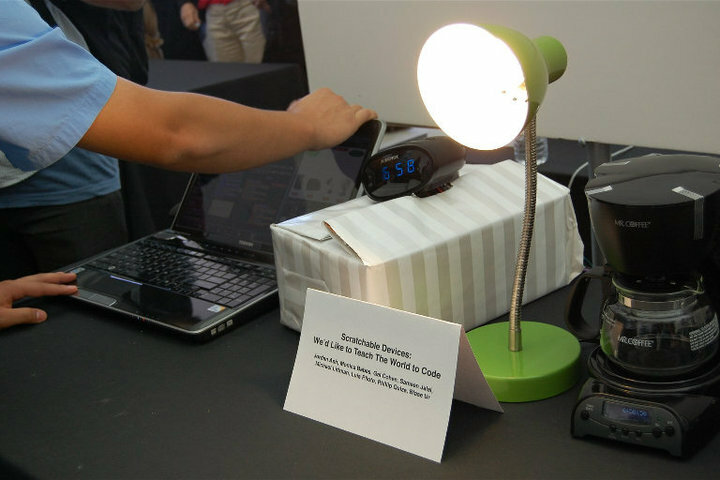 We have already built "Scratchable" lamps, alarm clocks, fans, and coffee makers, as shown below, with many more devices in the works. We use Arduino microcontrollers, XBee wireless modules, the Processing language, and the BYOB variant of scratch, as explained in our tutorials.